FROM GOODREADS: Lily Mason and her adorable pittie Smooshie both have a nose for murder, but this is one cougar-shifter who would give her left paw to never find another dead body. All she wants is to enjoy a simple life in her new town, her fixer-upper house, while working a job she loves. Besides, the mystery of whether Parker Knowles, her boss at the rescue shelter, will or won't finally ask her out gives Lily plenty to keep her guessing. 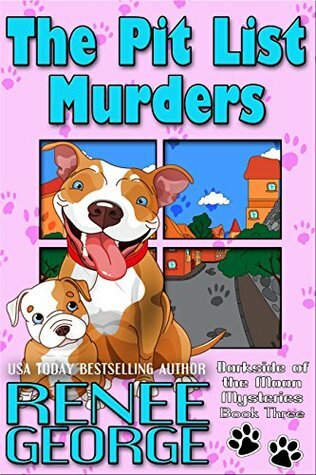 But when an abandoned pit bull puppy leads Lily and Smooshie to the corpse of a local Lothario, she is once again drawn into the seedier side of small town living. Even though she's warned off the case by the local sheriff, Lily is determined to find the killer. It doesn't help matters that more nasty notes are showing up around town, making Lily wonder if the two things are connected. Lily and Smooshie need to crack the case of the dead Don Juan, while navigating what it means to live in an all human town, before the secrets of the people she cares for are exposed. MY THOUGHTS: I had saved this book specifically to read for my "They Call It Puppy Love" challenge and I'm so glad I did because not only was it a solid mystery and a quick read, I got to spend time with my favorite Pit Bull (and Cass' book girlfriend) Smooshie. As the book begins, Lily is settling into life in Moonrise. She has made a close-knit group of family and friends and more importantly, has become mom to one awesome Pit Bull, Smooshie. One morning after a girl's night out, an adorable little Pit puppy is found wandering in the woods and we soon learn that Tino's womanizing dad has been killed. Fearing a close friend's involvement, Lily uses her shapeshifter abilities to try to figure out what happened, and learns that someone may be trying to kill her as well. I really like the characters of Moonrise and George does a great job of mixing a cozy mystery with some interesting supernatural elements. There is just enough romance to keep things interesting and I can't help but cheer on a budding relationship between Lily and her shelter boss, Parker. I have to admit I feared this was the last Smooshie book but a quick note to the author last week helped me discover that the next installment comes out in May. Yay, time with these quirky characters. My only real issue with "The Pit List Murders" is that I wanted more resolution for Tino. Maybe I'll find out what happened to him in the next book "Pit & Miss Murder." Glad you enjoyed it! I enjoyed my first book for the Puppy Love challenge. Review to come later. Love the cute cover of this book too. Can't wait for the review. This is such a cute series. Smooshie. How can one not love a dog named Smooshie? Smooshie is the dog, right? lol Anyway, this is a series I intend to read before I die. Yep, Smooshie is the adorable adult do and the baby is Tino, short for Valentino. These are so freaking cute! I'll have to check out the first one. Yes, they are fun reads. I tried to get this one for Puppy Love too but Amazon refused stubbornly to reduce the e-book price and I had to give it a miss! Yea I don't know why they haven't lowered them by now. Especially with a new one coming out. These sound like lovely reads and you have another one to look forward to with not too long a wait. I know. I was so excited when she told me!